Are Digital Classrooms the New Paperless Offices? My first job in marketing was back in the late 90s, when I was working for what was then the University of North London (now London Metropolitan). Whilst the 1990s really aren’t that long ago, the office environment back then was a world away from the kind of offices you’ll find in the UK in 2013. It was a time when people could get away with having a cheeky cigarette at the start or end of the working day if they made a half-hearted attempt to lean out of the window, and where a pint in the pub at lunchtime was standard practice for many of us. It was also a time when email and the internet were starting to change the way we lived our lives and operated in the workplace. Computers had of course established themselves in the workplace long before the 90s, but now electronic communications and networked systems were enabling us to function in different ways, everything seemed faster and more immediate, and there was a very quick and very obvious decline in the number of phone calls being made, as well as the number of memos being written (and I mean handwritten, with real carbon copies – imagine that kids!). We could all sense that the world was changing at a rapid pace, and whilst we couldn’t accurately predict how this would affect the world of marketing, what was perfectly obvious to all of us was that within a few years, the paperless office – an idea that had been touted since the 1970s – would become a reality. 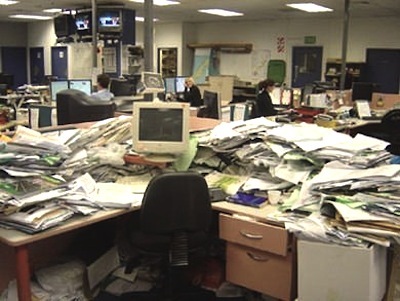 15 years on and paperless offices – in my experience at least – remain a complete myth. And it’s perhaps because I have this at the back of my mind that I am hugely skeptical whenever anyone mentions digital classrooms, and print being replaced by apps or ebooks. Earlier this year, on the Oxford University Press ELT blog, If there were no books prompted an expansion on this topic from ‘English Raven’ Jason Renshaw with his post Are ELT publishers going to make it App’n?. Before going into this, it’s probably worth noting that when I refer to my skepticism around ‘digital classrooms’ I mean ‘traditional’ classrooms with teachers and students in the same physical space, using only digital devices for learning. This is of course very different from ‘virtual classrooms’ where the teaching is conducted 100% online, and which I have some healthy skepticism around too, but let’s save that for another day. The original Oxford University Press post draws on an experimental approach in a couple of Californian schools, asking whether their method of teaching algebra with ‘interactive full curriculum apps’ on iPads could be just as successful in English language classrooms (‘success’ being defined here as achieving high grades in end of year exams – questionable in itself). Some obvious points are made about the importance of making the technology work for the aims and objectives of the class, not simply transforming printed books into digital format, but providing teachers with the kinds of tools they need – images, videos, contextualised language – to engage their students and meet their objectives. The potential opportunities for personalised learning are also touched upon. As mobile devices become more affordable and ubiquitous, we won’t be needing textbooks or even e-books; the future will be in apps. Building learning materials in app form creates all of the functionality, flexibility, interactivity and currency that teachers and students are now starting to expect. I am rather vehemently against the idea of simply converting existing textbooks into e-books … or chopping them into little parts to become dried up PDF or e-PUB potpourri. A clever approach to ELT course apps should allow them to be customised while still providing a core and a map. Forget the idea of trying to own/control the platform (and, by extension, all of the distribution). The publisher that tries that on will not only inevitably fail, they won’t be doing their reputation as The (greedy shareholder-appeasing) Empire any good either. Internet traffic today per person is measured in gigabytes, with six gigabytes of information exchanged per human per year. In 2017, that number will have risen to 16. By then, global data will be counted in zettabytes – roughly one trillion gigabytes. Obviously, global data on the internet is different from data on personal devices, but when I see numbers so big my small head can’t really make sense of them, it makes me think that getting a course book app (or several course books apps for that matter) on to a mobile device isn’t likely to be a problem for long. At least not in terms of storage. So, schools get these wonderful new apps on to mobile devices, but are teachers and students ready to use them? Not in Italy it seems, where Martin Lisboa commented that a couple of years ago, with students aged 18-26, he struggled to get them using digital content on a CD-ROM. This didn’t surprise me at all, and it’s something I’ve been hearing a lot from focus groups recently, from teenagers and young adults around the world – they still like to learn from printed books. Yes, there’s a small number who have embraced their iPads and would happily go 100% digital, but the vast majority still have a preference for learning from books and consider apps to be for fun, for entertainment, not for ‘serious’ learning. Perhaps this will change with future generations, perhaps it will take a while for learning on a tablet to feel ‘normal’ and perhaps ELT publishers have yet to produce apps that work effectively as learning tools. Then again, perhaps we’ve spent hundreds of years learning from printed books for a very good reason – because it’s a great way to learn. This leads neatly on to one of several insightful comments made by Brendan Wightman, starting with the obvious but often forgotten fact that, in some ways, we’ve seen this all before. Brendan refers to the “enduring legacy of failure where education and technology meet in formal classrooms” and goes on to make some very salient points about teachers being resistant to new technology being introduced from the top down, the potential conflict between informal, flexible learning and the formal, assessment driven syllabus, and the re-working of social arrangements that technology often brings about. Reading that summary you may be forgiven for thinking that the responses posted by Brendan reflect someone very resistant to the introduction of technology to the ELT classroom, but that’s clearly not the case. They are simply words of caution from someone who can see the need for books to be “re-imagined” and yet understands that this is likely to be a long, continually changing process, with many failures along the way. What a good teacher of the future will need, and can then provide to their learners, is enough coherent learning objects to suit the needs of their learners, to keep the class engaged, to help them learn and practise new language all within a well-tested and graded framework provided by an expert in the provision of learning materials. These objects will be for use both in and out of classroom, allowing us finally to arrive at the ultimate course, designed to fit each individual learner with the perfect combination of print and digital publishing. The key point here is that the ultimate course – whatever that may be – is one that’s designed to fit the individual. Digital content presents use with many opportunities on this front, but forcing digital materials on to individuals will never end successfully. Both teachers and learners need to be comfortable with their learning materials, and the introduction of digital elements needs to happen gradually and organically. Insisting on fast change and the abandoning of printed books in favour tablets – as is happening in some educational institutions – is inevitably going to result in backlash from those on the receiving end. Similarly, I would suggest that any international publisher with a broad range of customers who leaps feet first into apps at the expense of investment in print is highly likely to regret it. The digital classroom is no more a reality for most teachers than the paperless office, and whilst the world is changing at a rapid pace, changes in the way we educate should be gradual and carefully thought through, and certainly not based on point scoring by government officials, the determination of tech companies to get their hardware into schools, the desire of publishers to keep one step ahead of the competition, or a disastrous combination of all three. For me, I’m happy to use technology to increase interactivity and improve my understanding of the students. I’m convincible that an entire course’s content can be delivered that way too, but I’m not convinced yet.